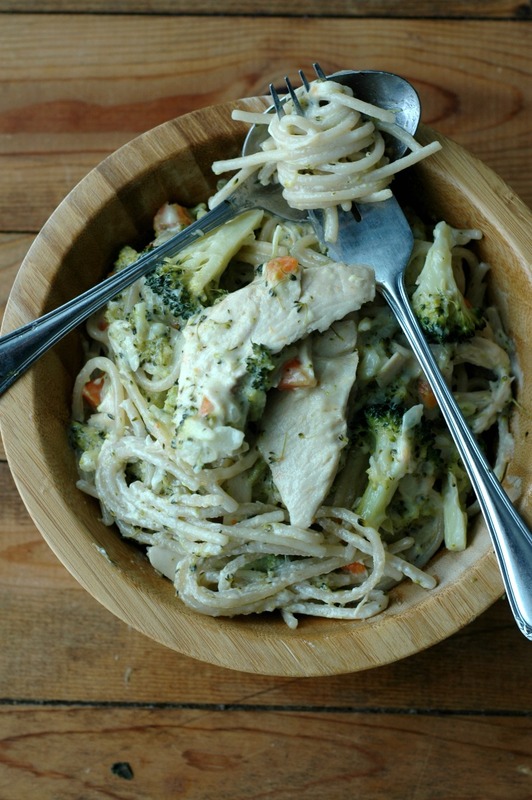 Classic Alfredo flavors in a fraction of the time, and made gluten, dairy, and nut free too! 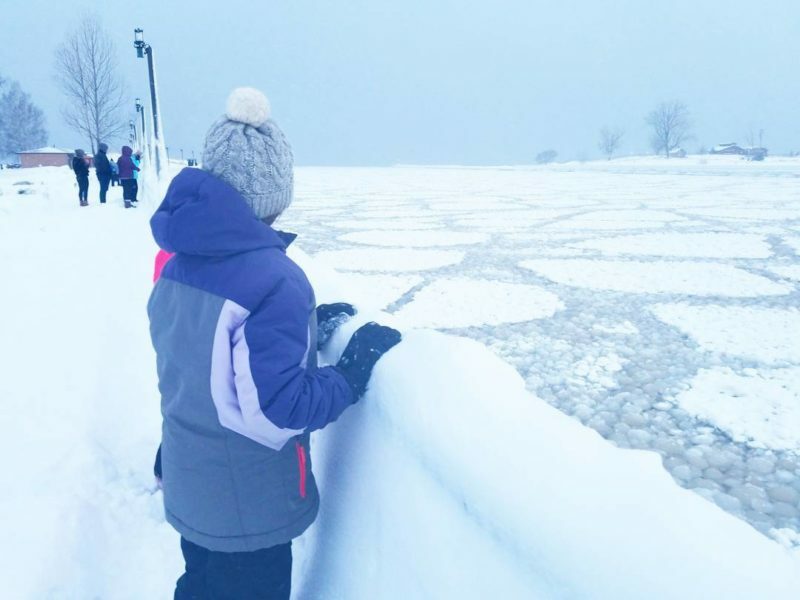 I hear Lake Michigan is over 50 percent frozen these days, and from the looks off the pier down the road at the beach…I believe it! During this frigid time of year, we are definitely in need of some dinner comfort to warm our bellies, and I’ve got just the ticket for you if you’re feeling the same way. I remember the first time I ordered alfredo pasta at a restaurant as probably a teen or 20 something. I don’t know of anyone that doesn’t fall in love after the first creamy bite, and I remember thinking this must be the best thing I’ve ever tasted. I also remember thinking…there is no way I could ever make something like this! Interestingly, Alfredo bases are really nothing more than a little garlic, butter, milk, and Parmesan. I am a huge fan of raw dairy, but if you are one that can’t tolerate that (sadly myself and one of my daughters included), there is another way! I have found coconut milk and nutritional yeast to be a great swap – you really can’t taste the coconut. I have a couple of coconut taste critics in my household, and this dinner gets gobbled up time after time without complaint. Cooking the noodles in the coconut milk allows the pasta’s starches to thicken the sauce and there really isn’t anything like indulgent, drippy, creamy, garlic infused Alfredo sauce! Weekday fast in the Instant Pot! It’s no secret, the Instant Pot has really been a game changer for a lot of family kitchens, and this traditional real foodie is one of them. It did take me a while to get the hang of it (let’s be honest – it took me 2 months to even take it out of the box! ), but it has become a counter staple for weekly bone broth, soups, and whole chickens, and full meals like this alfredo dinner. Literally one pot for the whole meal – that is definitely weekday friendly! 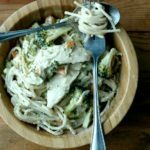 If you are grain free, I would recommend separately making this DIY alfredo sauce, and then just add some spiralized zucchini or sweet potato noodles. 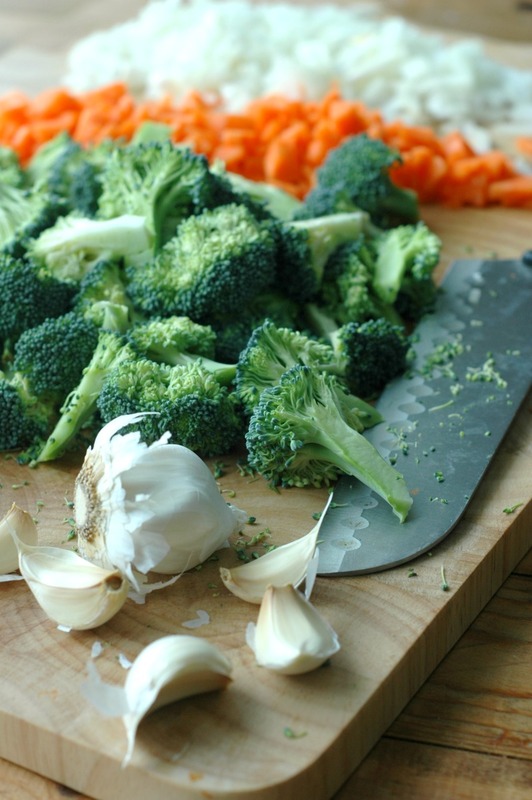 My kiddos love this dinner too, and it is a great way to get some extra veggies in. The recipe done in the Instant Pot using veggie noodles will not turn out. The starches from the pasta helps thicken the alfredo sauce, and the cook time would make veggie noodles way to soft. Add-ins to change things up! I wanted to keep this recipe as simple as possible, so that there were no more than 10 ingredients. This also leaves some room so you can put your own creative spin on it! I happen to love adding cherry tomatoes to the cooking veggies in the first step. I also tend to add a big hand full of spinach to wilt in after the pasta cooks. If you chop it really small, your littles won’t even know it’s there if that is something that would normally bother them – it is taste free and it just looks like herbs. One of my kids particularly loves it when I add peas, while the another likes when I add bits of bacon. Frozen broccoli gets too mushy. Believe me – I’d love nothing more than to just dump a bag organic frozen broccoli into the pot, but it just doesn’t work. Different pasta brands might have different cook times. I think cashew or almond milk would work if you don’t have coconut milk and like using those. If you tolerate raw milk/cream that should work great. I don’t think rice milk is thick/fatty enough, and I do not recommend soy milk. ¼ cup ghee If you tolerate butter, you can use that. If you don’t tolerate ghee, you can use avocado oil. Coconut oil will change the flavor too much. 1 tbsp nutritional yeast optional but gives the cheesy flavor of parmesan. You could use a good 2-4 tbsp parm if you tolerate the dairy. If you don’t have this on hand, a little extra sea salt will help with the salty bite of parm. Turn the Instant Pot on using the “Sauté” button, and melt the ghee. Add the onion and carrot with a big pinch of sea salt, stir to combine, and cook for 5-7 minutes so the veggies soften and sweeten. Stir the chicken and nutritional yeast into the cooked onion/carrot/garlic mixture. Pour the coconut milk in the pot, and then put the pasta in. Make sure the pasta is submerged in the coconut milk. 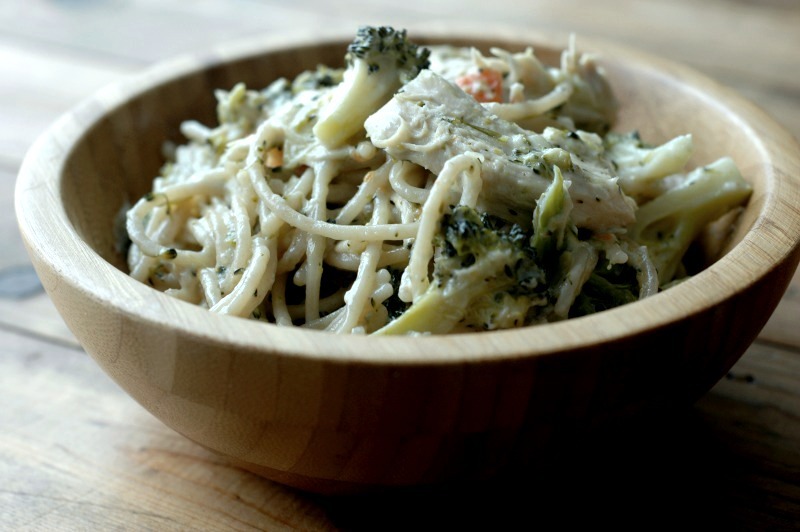 Put the broccoli on top of the coconut milk/noodle mixture – do not mix the broccoli in, or the noodles will not stay under the coconut milk and won’t cook all the way through. Put the lid on the Instant Pot, and be sure the valve is closed. Press the “Manual” button and bring the time down to 2 minutes. The Instant Pot will take a few minutes to come to pressure, and then it will count the 2 minutes down. When the Instant Pot beeps after the 2 minute countdown, turn the Instant Pot off (do NOT release the pressure valve yet), and set a timer for 3-4 minutes. 3 minutes will leave your noodles with an al dente bite, and 4 minutes will leave them softer. After 3 minutes, release the valve for the rest of the pressure in the Instant Pot, and take the lid off. Stir everything up – I like to let it sit for a few minutes to absorb some of the liquid – this will also allow the noodles to soak in more liquid. Sea salt and pepper the alfredo to your taste and serve! 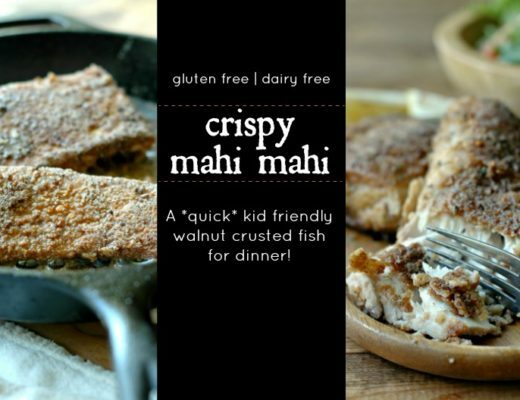 Walnut Crusted Crispy Mahi Mahi :: Kid Friendly and Gluten Free! Tuna Salad For All Ages! Oh gosh this looks good. Honestly, I wish this was my breakfast this morning. It sounds like pure comfort food and I could use some. So yummy! I adore alfredo! I can’t even believe this is dairy-free, yet it looks like the “real” thing! Definitely making! This is amazing, that you’ve figured out how to make delicious noodles in the IP, amazing. Thank you for doing the work of that! 😉 I love Jovial pasta, too, that they pre-soak, so cool. Such a great family dinner, Renee!! Oh my goodness. I cannot wait to try this! Alfredo is one of my all-time favorite dishes. Yum!! I love a dairy free alfredo and yours looks SO CREAMY!! I’ve never done a sauce in an Instant Pot!! Such a great idea! 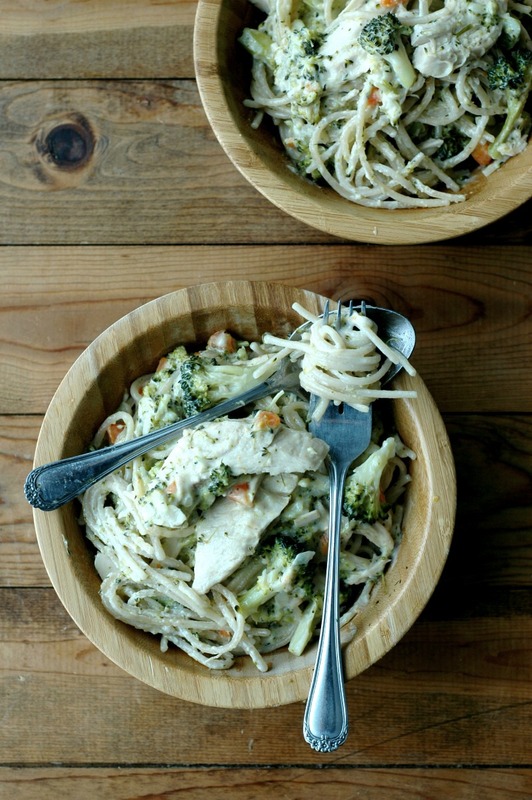 I used to love alfredo sauce growing and I’m all about this healthy, IP version! Looks so creamy and comforting. Instant Pot alfredo…dairy free? Be still my beating heart! Looks so darn good! 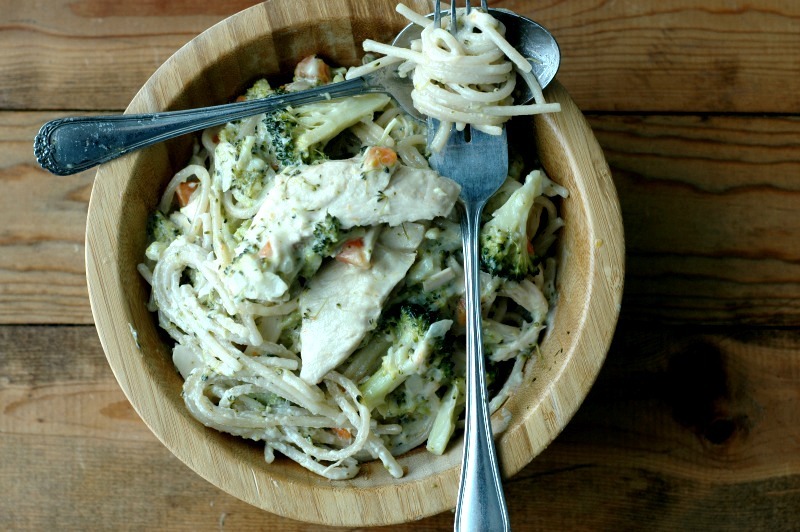 Who doesn’t love a creamy, healthier alfredo! 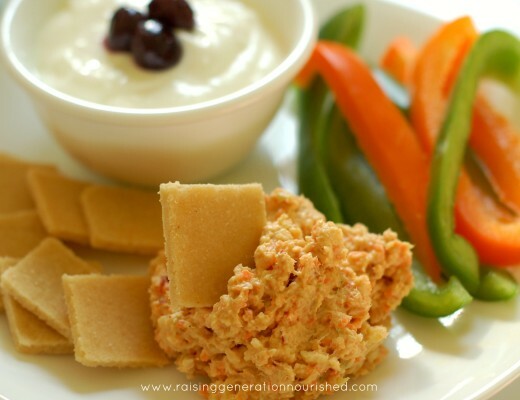 Love that you are using nutritional yeast! I love alfredo! It’s great to have a gluten free, dairy free version! I love IP pasta. So easy and fuss-free. I love all the veggies in this too- just how I like my alfredo! The sauce is fab. You nailed every little piece of it. I know cooking GF pasta in the IP can be tricky, so I really love a good success story recipe. WOW, is there anything you can’t make in an instant pot? YUM! This looks so yummy! I will have to try it without the pasta, especially since it’s made in the Instant Pot. YES! I think I was actually trying to create something like this other day when I kind of failed (I mean, it was good, but not creamy like this because I didn’t have coconut milk – and I didn’t make it in the IP). I am so going to try this. I am drooling looking at this, and one pot meals are the best after a long winters day at work! 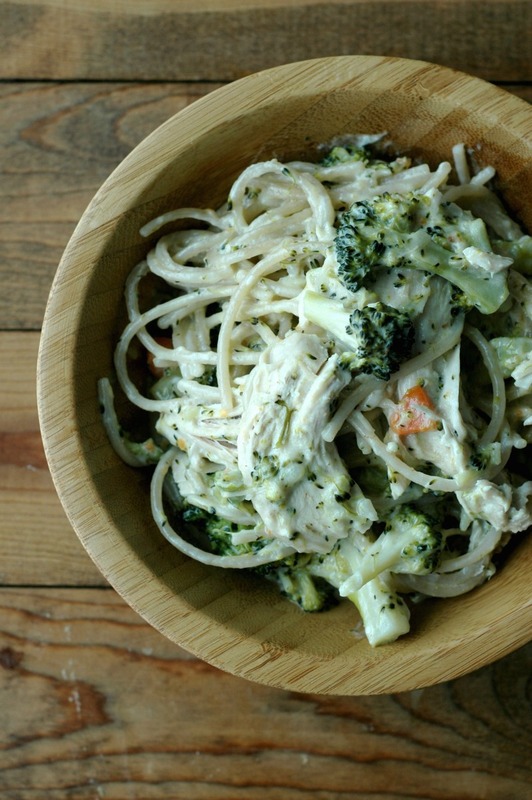 This coconut milk alfredo looks just delicious… and comforting and filling! What a wonderful one-pot meal for a cold winter dinner! I love alfredo too, but all the heavy cream is a bit much for me these days, so I’m really intrigued by your combo of coconut milk and nutritional yeast – sounds scrumptious! I love this version of alfredo! 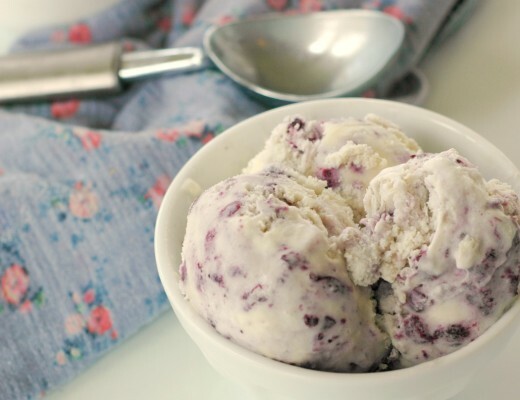 So light and creamy, it looks and sounds amazing! Yes girl, you are speaking my language. Coconut and nutritional yeast are my faux dairy saviors!!! Wow! This looks amazing. I like your dairy-free suggestions. I have a coconut milk sleuth in my house, so I’d be curious to see if he could taste it! Wow, this is the first time I see alfredo made dairy-free! Would olive oil work too? I’m not very fond of avocado, and can’t tolerate ghee. That looks totally creamy delicious ! This is perfection, looks great! I cant wait to try it! Oh, man! This sounds so creamy and cozy. YUM!! Never thought of making Alfredo this way. Nobody in my household has allergies or intolerance to any kind of food, but I am always looking for dairy free options in everything! 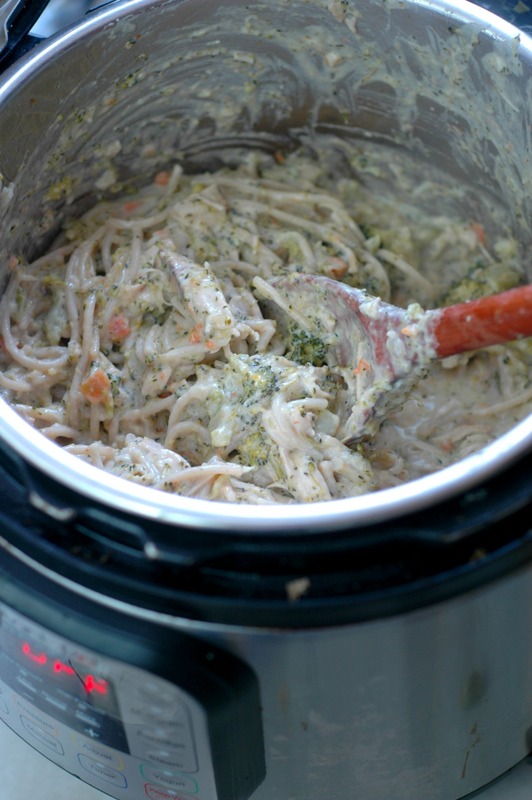 I love me some Alfredo and what a genius idea to make it in your Instant Pot! Looks so yummy and perfect for those cold winter days. Hi Sabrina! I’ve never had a problem with it not getting thick – did you leave any of the ingredients out, or modify? A lot of the times I end up adding more liquid because it gets almost to thick! Could this be doubled and cooked in an 8qt instantpot? Hi April! I have never worked with an 8qt IP, so I’m not sure!